Want to show off your latest achievements and accomplishments on a varsity sports team? There’s no better way to do that than with a Chenille Patch. 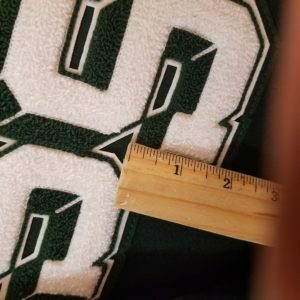 Chenille, a type of yarn, can be used for many things, but most often is used to create high school or college patches. These patches often have to be earned, and are a sign of accomplishment in a varsity sport or other type of extracurricular activity. But when you wear chenille, what exactly are you wearing? How is it made? And what can you what can you do with chenille patches? Let’s take a look. Chenille is a type of durable yarn that actually derives it’s name from the French term for caterpillar. This is because, when woven, the fabric actually takes on the soft and furry resemblance of caterpillars. The main product within Chenille is cotton, but other products like acrylic, wool, silk, rayon, and olefin may be used as well. The softest and most durable products made from Chenille are created with 100% cotton. In creating such a softness, 100% cotton Chenille is often the choice for things like blankets and throws. Chenille patches can be created from 100% cotton, but are more commonly produced with a mixture of the fabrics previously listed. How are Chenille patches made? While every manufacturer will create Chenille patches somewhat differently, most will use a combination of a chenille background with an embroidered thread for details. For borders, there are a variety of different fabric options including traditional embroidery, chenille bordering, or laser cut felt border. With that being said, most people opt for the laser cut felt border on chenille patches. For patches, you can also opt for single, double, or triple felt (the background on which the chenille is stitched). Single felt is the cheapest option, but triple felt will give you the most durability and protection. For backing, you can choose from heat seal, plastic, adhesive, or Velcro. Again, these options may vary based on who is producing the patch. What are the different types of Chenille Patches? Of course, this is not an extensive list of everything you can do with Chenille patches – it’s just a small sample! What can you do with Chenille Patches? 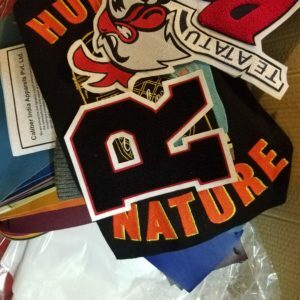 If you have earned a varsity or school letter, now it’s time to decide what to do with your patch. Really, you can do anything you want with your patch. Many people sew them to pillows, some people frame them, and others put them on sweaters and towels. 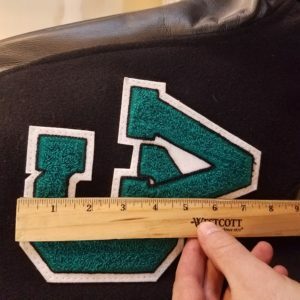 Most commonly, however, people will display their chenille school letter patch on a Letterman jacket. 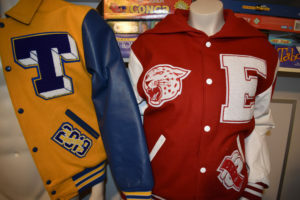 Not only are Letterman jackets stylish, but they allow you to flaunt your sporting abilities to the entire world! Get your Letterman jacket today and show that you are proud of your accomplishments!